Home theaters or speaker systems are now a must have for every home. Today’s LCD & LED TVs doesn’t produce realistic sound, computers also doesn’t come with a good speaker. And a good music system is also wanted in every home, because everybody loves to listen music. That’s why in this article, we will be talking about the top 5 best 5.1 speakers under Rs 10000 which are available in India. Now if you don’t want to spend that much money for a music system, you can also view our best 5.1 speakers under Rs 5000 list, there you will found some best home theater system even with low budget. All of these best 5.1 speakers under 10000 rupees are available on Amazon India site. You can also go to your nearest local shops to search these speaker systems. But if you are lazy or you have no time, you can place your order right away from Amazon and the speakers will be delivered within 5 days or less. We have given links to all products listed here. We have chosen these speakers best for the budget of Rs 10,000 based on many parameters. We have looked over the design, features, power consumption, speaker capacity, Bluetooth connectivity availability, Remote control availability and many more things. Now all speakers may not have all features, but still they are best in this price range considering their overall performance. RELATED : Top 5 Best 4.1 Speakers With Bluetooth In India. What’s more? We have also kept our eyes on the Amazon ratings are reviews. Because they also indicates how satisfied users are after buying those speaker systems. This makes sure, you won’t get into any trouble after buying any of these. This is one amazing speaker from the best brand in the industry. It produces 5.1 surround sound and comes with the 8 inches large high efficiency woofer which produces extreme bass. Satellite speakers are also good looking and produces good music. It is compatible with most of the devices such as TV, Computer, SmartPhone, CD/DVD Players, MP3 Players, etc. USB and SD card slots are also available where you can directly plug and play without any other device. F&D is a very well known home theater and speakers brand in India right now. F&D home theaters produce superb sound quality still comes at affordable price unlike large brands. This is a fully functional multimedia speaker system around Rs 10000. It has an LED display, Remote controller, Stylish look, USB & SD card support. But it doesn’t have built-in Bluetooth connectivity. But don’t worry, it’s a good system and you can buy a Bluetooth adapter at just Rs 125 without any delivery charge from Amazon by clicking here. Mitashi is also a well known electronic brand since years. This 5.1 channel home theater system is fully compatible with any devices. USB & SD card slots are available. Digital FM Radio support is an added advantage for this music system. Bluetooth is also available so that you can connect your mobile with it wirelessly and change, play music directly. A wireless remote control with all functions is also available. This is not just a home theater, it’s a full set of multimedia console. It comes with a DVD player which you can use to see videos also upto 1080p. It has a sub-woofer and 5 multimedia tweeters. You can enjoy HD movies sitting at your home with 3D realistic surround sound. It’s a perfect entertainment kit for medium and large size rooms. Plus it supports HDMI output, USB connectivity. It also has a remote control which is fully functional. But it doesn’t have Bluetooth connectivity but here again you can use a Bluetooth adapter which comes at just Rs 125 on Amazon. This Zebronics 5.1 speaker system is a balanced deal and it’s completely value for money. It has almost all the features which we look for. It has an LED display, USB & SD/MMC Card support, FM Radio, LED power indicator and many more. A fully functional Remote controller is also available to adjust sound wirelessly. Plus Bluetooth connectivity is still there to connect your smartphone directly to it and play music from your phone. It also produces good bass and comes in a stylish look. Moreover it produces clear sound and pure BASS. 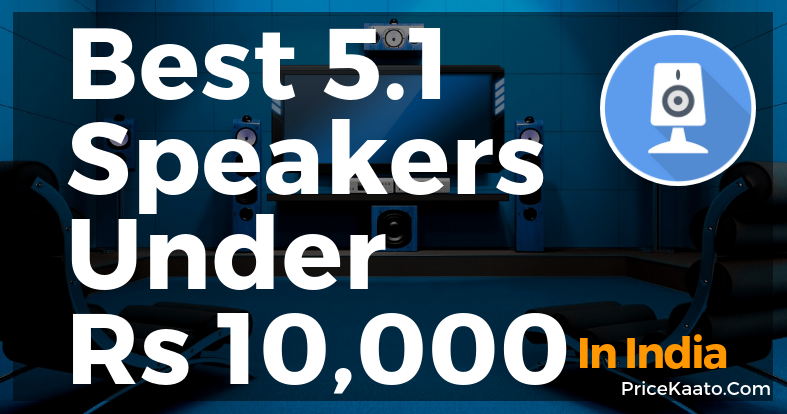 So, these were the top 5 best 5.1 speakers in India under Rs 10000 from the best brands. Now let us know, which one you liked most and looking forward to buy? Or if already have one, how’s your experience? Please tell us in the comment section below.